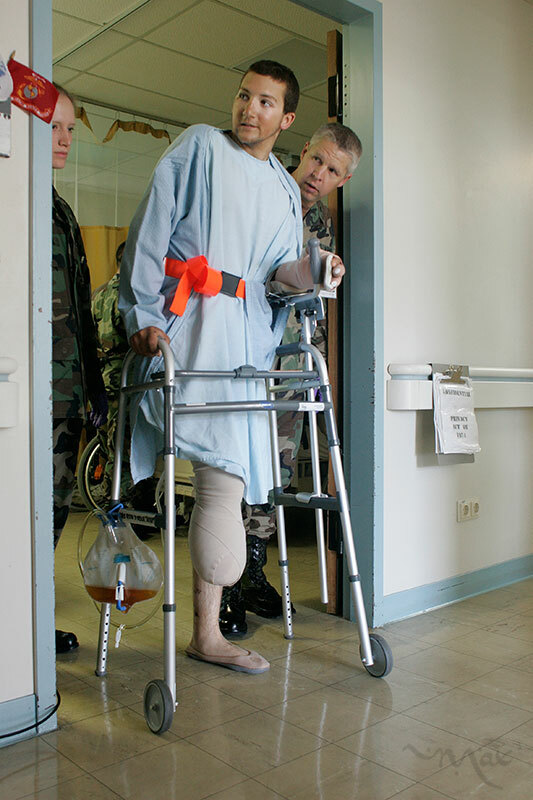 01182013_Becherer_IraqMedical026: Doctors of War: Casualties of War: Global News Portfolio: New Orleans based Photojournalist covering the Deep South and beyond. Physical Therapist Maj. Ford David Paulson helps Marine Lance Corporal Matthew Schilling choose which stretch of the hallway to tackle, the short way or the long way, as Schilling takes his first walker-assisted steps at the Landstuhl Regional Medical Center. Schilling chose to take the longer trip. Schilling returned to his bed exhausted but satisfied that with a modern prosthetic limb, he would be able to walk again. Once back in the United States Schilling will join the ranks of approximately 5,557 soldiers who have suffered wounds in Iraq in the year 2005 alone. Some 15, 955 have been wounded since the start of the war according to information released by the United States government.